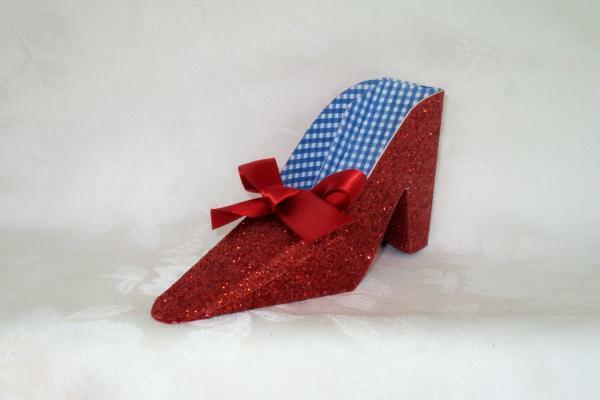 Our meticulously hand-crafted glitter shoe favor boxes, designed to represent Dorothy's Ruby Red Shoes, are the perfect favor boxes for a Wizard of Oz birthday party. Made from heavy, specialty glitter craft card stock and lined with gingham blue scrapbook paper, these unique favor boxes are sure to be much loved! These glitter red shoe favor boxes are approximately 5 3/4" long, 3" high and 1 3/4" at their widest and are very sturdy (not flimsy at all).